You can probably see the value Big Data brings to any organization that makes an effort to use it. You get not only productivity gains, but also faster insight into your problems. However, anyone who spends time online instinctively knows that data is continuing to grow at a rapid rate, which presents a few challenges. Volume: Tons of data is generated around the globe and the volume will continue to increase exponentially in the coming years. Variety: Different and new kinds of structured and unstructured data (such as social media data) are being created. Velocity: The pace at which data is mounting is accelerating, and companies’ ability to analyze it in real time is crucial to the development of tangible offers that turn shoppers into actual customers. Veracity: Veracity refers to the trustworthiness of data. Is the data that’s being generated valid? When analyzing data about customer sentiment on social media, for example, can you trust everything that’s been written? 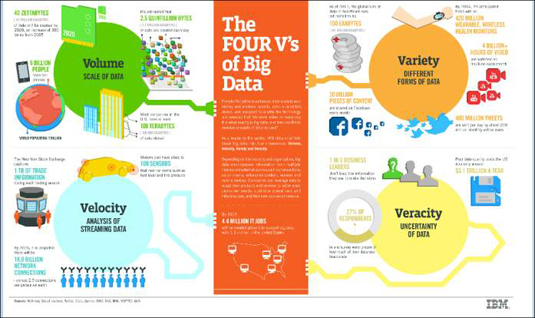 IBM has created an excellent infographic illustrating the Four V’s, as shown in the following figure. These four factors influence the management of Big Data. Whether you’re a small-business owner or an executive of a major corporation, you are affected by the onslaught of data.